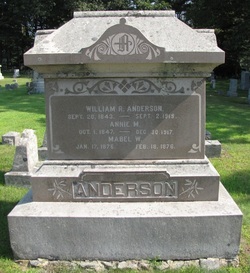 WILLIAM R ANDERSON was born in Sackville, New Brunswick, Canada on 20 Sept 1843 [or 1845 - US Nat Index], the son of Amos and Mary Anderson [death rec]. He died on 2 Sept 1919 in Boston, MA [MA Death Rec; Wells VR, pg 603, says 4 July] and is buried in Ocean View Cemetery, Wells, Maine. He married circa 12 Nov 1869 [intents filed - Wells VR p489] to ANN M BENNETT, who was born 1 Oct, 1847 in Maine and died 30 Dec 1917 [grave stone; Wells VR p596]. Also did not find her death rec in ME VR, so may have died in Boston area. William was called a blacksmith and a farmer in census records. His brother Amos also served in the 27th ME. The US Naturalization papers show that William R and Amos immigrated in 1853, arriving in Boston, MA. They were both naturalized on 16 Mar 1866 [US District Court, Portland, ME]. William was living in Dorchester, MA by 1917 [Boston St Dir]. 1. Roberta Mansfield, born Jan 1890. She was listed as an Anderson on 1900 census with her mother, and called Roberta Mansfield Anderson on 2 Oct 1912 when she married Frank Griswold Smith [Wells VR pg 577]. II. MABEL W ANDERSON was born 17 Jan 1876 and died on 18 Feb 1876. She is buried with her parents in Ocean View Cem, Wells.